Part Two of our training (or really Part One, which included a really cute shaping session with her basket/pedestal that my phone ran out of room for) is just a typical dinnertime trick training session. Ruby is working mainly for her regular kibble with a few soft treats mixed in. She is not normally this excited about dinner by itself - she genuinely enjoys training which delights me. I've really been enjoying Meghan's videos at Nala the Wonder Dog and find them very helpful, particularly her different and playful ways of delivering treats. In reviewing my own videos I am filled with love and admiration for Ruby's enthusiasm and intensity. She watches everything I do and I adore how creative she is with her tries. The "peek-a-boo" position between my legs is one of our newest tricks, and remaining in a down position while I step over her requires a great deal of trust on her part. Her kibble-catching is also very impressive. She is just so much fun! This post is part of the Positive Pet Training Blog Hop, hosted by Cascadian Nomads,Tenacious Little Terrier and Rubicon Days. 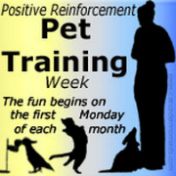 This month's theme is training for safety/emergencies for National Pet First Aid Awareness Month. The hop happens on the first Monday of every month, and is open for a full week - please join us in spreading the word about the rewards of positive training! Oh my goodness her intensity, she's such a little firecracker, I love it. I've also been contemplating doing some muzzle training. I don't have one yet either, but I love your idea at introducing the muzzle behavior. I just know that as Laika's arthritis gets worse the vet visits are going to be even more stressful/painful on her, and I'd like to be prepared beforehand with some muzzle training. I've never used one before, so I'm nervous, but at the end of the day we are our dogs only advocates - and I don't want to be the one who says "she's never done that before." I always insisted my previous dogs be muzzled at the vet - they were both so fearful and it was safest for everyone. I can't imagine Ruby nipping, even as anxious as she is but we can never predict 100%. Boca is a DREAM patient and a favorite at the vet's office! Great post! I decided to write about muzzles this month, too! Ruby is too cute! I love her energy and enthusiasm. You had some really great suggestions for ways to use a muzzle! She is delightful - now if I could only get that focused attention outside of the house! That's what I love about positive reinforcement - it's fun for everyone! Ruby is the funniest dog! Innovative way to train! I had no idea how much her tail wagged until I started filming these sessions, and normally she is a pretty reserved tail-wagger. Oh, what fun! Since we've been in the middle of moving to a new home, we've had to put any new trick training aside for a bit, and your videos really make me miss it more! We work in fits & starts, I really love this monthly hop to keep me accountable. I still haven't applied for her trick titles, and we have more than enough tricks. We can't wait to see what you'll be up to next when you get settled in! I can't decide between tricks and working on a title, or maybe taking a Fenzi Dog Sports Academy course in nosework. Either way I know we'll have fun! I had meant to also say that using the cup was a great idea to help with getting used to a muzzle. I need to train Luke to a muzzle, and I have already seen him put his nose in a cup when we were working on getting him to pick things up, so I feel a little less worried about how he might do with a muzzle. Ruby looks so happy to be training. We need to refine our peekaboo trick! Oh! Plastic cups! What a great idea for muzzle training -- that's super smart and I'll pass that along to folks for sure. FYI the peek a boo position looks great for administering eye drops! I agree she is so much fun! She looks so excited to be training! Love it. Because Honey came to us as a puppy, we followed the guidelines of Dr. Ian Dunbar to teach her bite inhibition. I truly believe that Honey is absolutely bomb-proof about biting, even in an emergency. We've had rough games of tug (her favorite) where I got a little flesh caught in a toy and had her instantaneously inhibit her bite. So for us, that early training is our version of muzzle practice. Ruby looks like such a fun little dog! I'm so impressed with her--all confidence, shoving her face into that cup. Could you bottle a little of that and send it to Nala? :) I also love that pushing behavior--Ruby should do Treibball! Oh, and thank you for the shout-out--I'm so glad you've enjoyed the training videos that I've shared. Love the peekaboo trick! Ruby's so cute! When we traveled to Italy with Rocco we learned that dogs are allowed on public transportation there but may be required to have a muzzle. I had one with me but never was asked to use it. The cup is a great idea for training it. Since I had to buy a muzzle for our trip, (but still haven't ever used it) I trained using the muzzle in the same way you're using the cup... rewarded Rocco for touching it with his nose and then sticking his nose in. Great post! Love this video, so adorable! Thanks for the post!